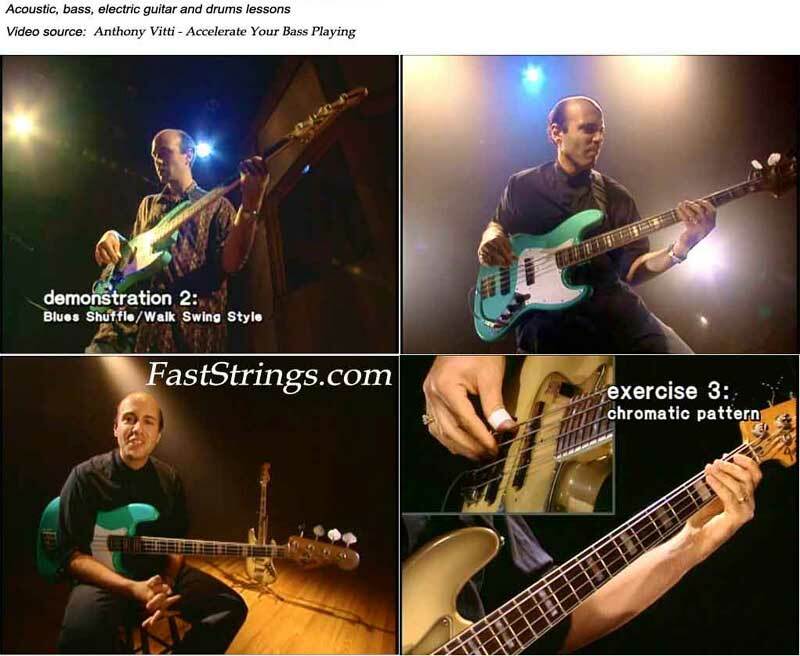 Anthony Vitti Accelerate Your Bass Playing DVD download. This DVD will help take your playing to the next level. Professor Anthony Vitti shares his proven method for improving the fundamental skills required to freely express yourself on the bass in many musical styles. Professor Vitti is a graduate of the Berklee College of Music and has been teaching there since 1990. He is known for his contemporary style of playing, particularly for knowledge and instruction in slap bass, fingerstyle R&B, and sightreading. He has played all along the East Coast with a variety of artists including Sammy Davis, Jr., Liberace, Toy Caldwell, Steve Smith, and Blues Saraceno, and currently tours with Herb Reed & the Platters. Terrific exercises, with examples played by Prof. Vitti, plus split screen films of his top playing. If you are disciplined and willing to stick with the lessons sequentially, this is one of the best I’ve seen. This DVD will help you develop groove and technique. Contains a number of exercises, interval and ear training as well as stylistic approaches on Bass. This DVD is good for not only beginners but those who have played a short while. If your new to the bass and would like to start here is a good DVD it not only shows you the basics but pick playing, slap playing. just before downloading, is there any booklet with the DVD ? Most accurate and convincing methods of playing and mastering the bass. Anthony Vitti, a true icon.